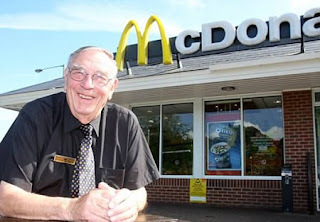 Grandfather Bill Dudley is Britain's oldest McDonald's worker – aged 85. He says the staff are like family and he wouldn't be without his part-time job. Bill, a retired taxi driver, greets customers and wipes tables at the fast food outlet in Mold, Clwyd.